heritage breed, a vital part of the Navajo culture and economy, was persecuted by the U.S. government in the late 1800's by military actions and again in the early 1900's through stock reduction programs. Surviving churro sheep were found in isolated villages in Northern New Mexico and in remote canyons of the Navajo Reservation. By 1977 the breed had dwindled to less than 500 sheep, so the Navajo Sheep Project was formed to revitalize it. 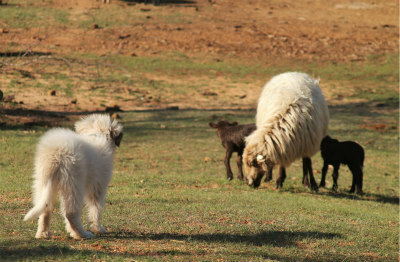 Although still rare, through the efforts of that program and dedicated breeders both on and off the Navajo Reservation, the Navajo-Churro sheep recovered to safer numbers. perfect animal for the small homesteader looking for a hardy, versatile, heritage animal for the farm. 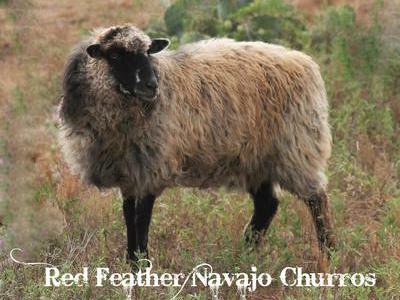 We invite you to visit the Red Feather Navajo-Churros Facebook page to view more pictures of our sheep and the ranch. We used two brown rams for the 2018 crop of lambs. This resulted in a lovely crop of colorful lambs with excellent fleeces. For the 2019 lamb crop we also added a white churra marked ram lamb. We run roughly 20 ewes on our ranch. Like our adult rams, our adult breeding ewes are registered with the Navajo-Churro Sheep Association. As a handspinner I strive for a colorful flock with correct fleece and lots of luster. At Red Feather Navajo-Churros we breed for an old style Navajo animal that stays true to its roots. Particular attention is paid to producing a versatile fleece for handspinners while keeping with the Navajo-Churro standards. Pictured are lamb fleeces from lambs we reserved from the 2018 crop.